Who would have thought that I’d get speed ups whenever there is a calamity? I know I shouldn’t be happy, but who wouldn’t? I’ve been downloading at a semi-steady rate of ±100 kiB/s, and have been getting boosts of up to 175 kiB/s on BitTorrent and above 200 kiB/s on linear HTTP downloads. Amazing, isn’t it? Thinking that I still have that cheapest old myDSL plan, which isn’t NGN yet, advertised at 384 kbps. I think I’ve currently downloaded 2.5 GiB of data within the last 24 hours, not including what my father had on our desktop. Any more ideas on what to leech? I have to get the most out of this before the Sun comes. Heh. Anyway, are you experiencing this as well? One friend of mine have had comparable results, but not everyone on the same ISP. 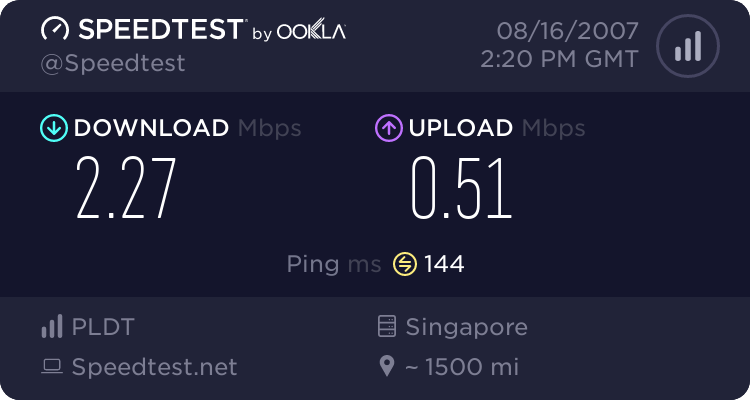 I really don’t think PLDT has had my connection upgraded yet, for they required me to pass a speed increase application form for old subscribers that I still haven’t done yet. ^ I know, what the hell, right? It should be automatic! After losing to the Transformers T-shirt raffle, and not being able to participate in the Happy Potter and the Deathly Hallows alternate ending contest that turned out to be just a book raffle, I knew I just have to take the chance on this one. Besides I’d really like that dog tag. Yuga is onto another raffle contest. This time, it is about the third installment of the films based on Ludlum’s Bourne series— The Bourne Ultimatum . He would draw a combination of three countries where the film was shot, and anyone who has chosen that specific combination wins. So, everyone, gather up your luck and choose the three countries you think would go to Yuga’s hand during the draw. a David Webb dog tag replica. There would be two raffles, just check out his post to know more about it. Good luck to me … for the dog tag! I just came to realize that my most hated subject at the moment, EE204: Energy Conversion, in which I have flunked my exams 2 out of 2, would be useful to me as an aspiring Electronics Engineer. At first, as an ECE student, I thought I’m not going to need this course since I’m not planning to specialize in electric power generation that EEs should be doing. While browsing through blogs and tech news sites like I usually do, I’ve read about emerging technologies that deals with the use of hand cranks and similar manually-operated power generators, instead of the conventional way of plugging devices onto a power outlet. I’ve also read about environmental issues concerning electric power consumption and conservation with computer and even search engine usage. We still haven’t gone to discuss DC generators as we are just halfway through the course. But, seeing how the OLPC plans to make human-powered laptop computers by means of a crank, a pedal or a pull-cord in the form of XO-1 to be distributed to children on developing countries who have little access to electricity, I got the insight. Furthermore, I just saw a portable media player utilizing the same idea, thanks to Bernie of Talkin’ Tech. I know I shouldn’t have been posting this now as our preliminary exam week is just a day away, and the exam on EE204 is first on the list. I am just happy to see current applications of what I am studying theoretically as it gives me more understanding of the subject matter. So, let me just ask, what would you say about manually-powered electronic devices that use less power than conventional ones? Would you be seen using it in the future or you would just stick to conventional devices until none of them exists anymore? Hand cranks and pedal generators on the nearest Wi-Fi–enabled coffee shop, anyone?